I am like a kid in the candy store whenever tomatoes arrive at the farmer's market. I want to take them all home and eat them at every meal. And, one of those is possible during the summer. 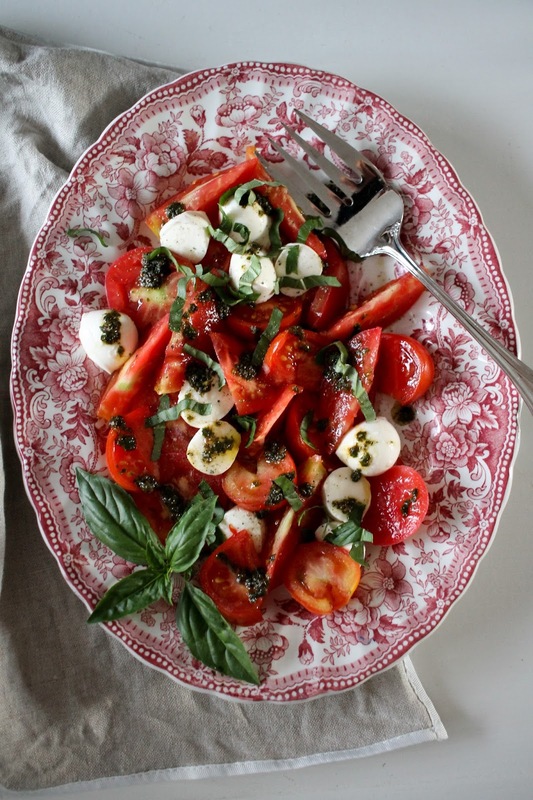 Cherry tomatoes are always the first to appear with their sweet flavor and juicy interior. I add them to any dish I can, but always look forward to making this salad. 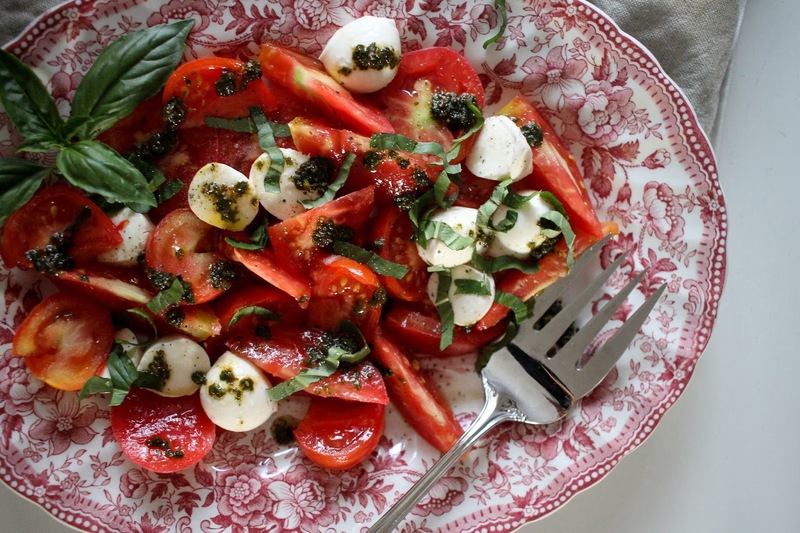 Caprese salads are good on their own, but I find the balsamic vinegar that accompanies many of them overwhelming. Adding a bit of pesto feels more aligned with the season. Plus, it is a great way to use basil if you have an overwhelming amount coming out the garden. But, having too much basil is never a problem for me. Depending on your tomatoes (I used a mixture of slicing and cherry tomatoes) cut your tomatoes in half or wedges. You want them to roughly be the same size and be able to easily pop them in your mouth. Place in a colander, sprinkle with salt, and set aside to drain. Cut mozzarella in half and place on a serving platter. Dry tomatoes with a paper towel and place amongst mozzarella. Whisk together pesto and olive oil until pesto takes on the consistency of a vinaigrette. 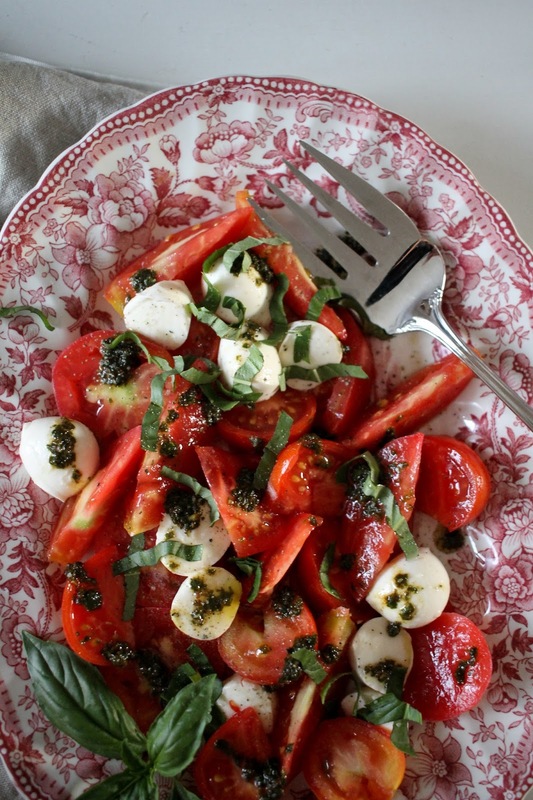 Drizzle pesto over mozzarella and tomatoes. Season with salt and pepper. Garnish with basil. Serve immediately.